MOSCOW, Russia -- Since the Ukraine crisis erupted last year, Western leaders have consistently accused the Kremlin of manipulating media coverage, fudging facts, or concocting outright fabrications to deny its role in the conflict. Lost in translation? 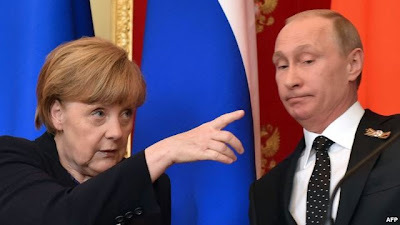 German Chancellor Angela Merkel (L) gestures as Russian President Vladimir Putin looks on during the pair's joint press conference at the Kremlin in Moscow on May 10. Now, an official interpreter at a Kremlin press conference has omitted a top Western leader's stinging criticism of Russia's annexation of Ukraine's Crimea region in March 2014. Standing next to Russian President Vladimir Putin at a May 10 press conference in Moscow, German Chancellor Angela Merkel made clear her views of the Kremlin's seizure of Crimea. "We achieved cooperation between NATO and Russia," Merkel said. "Due to the criminal and illegal, under international law, annexation of Crimea and the military conflicts in eastern Ukraine, this cooperation has suffered a serious setback." The word "criminal," however, was excised in real-time by the Russian-language interpreter at the press conference. Those listening exclusively to the interpreter were given the impression that Merkel considers the takeover of Crimea only a "violation of international law." It is unclear whether the interpreter made a conscious call to soft-pedal Merkel's rebuke, or simply missed the word. But in any case, her version of the German chancellor's words is the one posted on the Kremlin website and enshrined in the Russian government's official transcript of the events. The German-language transcript published by Merkel's office includes the chancellor's reference to the "criminal" annexation" of Crimea. One person who certainly would have understood the German word for "criminal" used by Merkel – "verbrecherisch" -- is Putin himself. The Russian leader, who was stationed in Dresden with the Soviet KGB in the 1980s, is a fluent German speaker and in the past has spoken with Merkel in her native language. Whether he heard the word might depend on what ear Putin was listening with. He sported an earpiece on his left ear, presumably to listen to the Russian-language interpreter. His right ear -- the one closest to Merkel -- was free of electronic accoutrements.